Do you know these people? 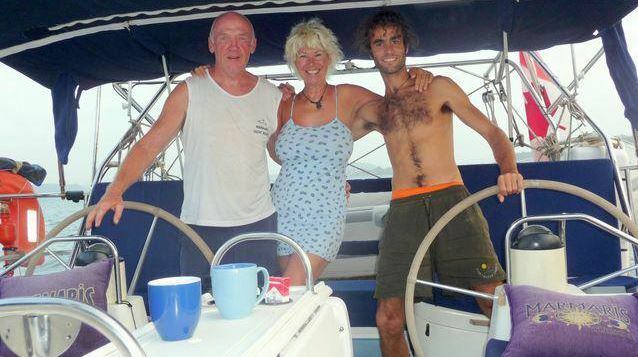 This photo was taken of them on their nautical excursion to the Galapagos Islands. Interesting as that may be, it has nothing to do with the Jesuit Schools Network. 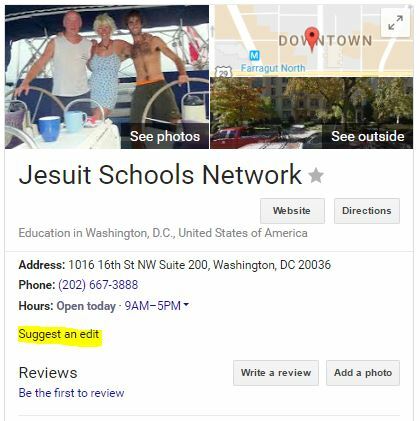 Such is why it is terribly unfortunate that it is the image that Google displays when someone does a search on "Jesuit Schools Network". The good news is that Google provides a feedback mechanism by which this can be corrected, providing enough feedback is given. Visit the search page and click the Suggest an edit link as shown above. Copy and paste the text below into the suggestion field and submit it. This image is not related to the Jesuit Schools Network and is an inappropriate visual representation of our organization. Our official logo is available at https://www.jesuitschoolsnetwork.org/sites/default/files/jesuit_schools_network_v_color_0.png. The more submissions Google receives, the more likely they are to make this important change. Please contact me if you have questions. Thanks! Meanwhile, our next Quick Clicks newsletter is scheduled for Tuesday, March 14. If you have scoops for this issue, please add them to our Newsletter Editors Room. If you have events that you want integrated into the JSN event calendar, please add them to our Event Catalog spreadsheet and we will input them into the calendar system.